Twenty-two youth and adults traveled to Austin, Texas when the diocesan youth attended this year’s General Convention of The Episcopal Church. The Diocese of West Missouri Youth Program was able to take 22 youth and adults to the 79th General Convention of The Episcopal Church in Austin, Texas at the beginning of July. It was a week full of learning and growth for everyone involved. Through legislative sessions, meetings with passionate Episcopalians, and powerful worship services, our youth got to experience the loving sense of community in our church. Our group stopped in Denison, Texas on the drive down and stayed at St. Luke’s Episcopal Church for the night. We got to learn about all of the ministries St. Luke’s provides for their community as well as help serve dinner to people from the community. On our way into Austin, we went to the T. Don Hutto Residential Center to attend the prayer service Mthr. Megan Castellan and many others organized. Getting to gather together to witness in solidarity with the women at the center was a powerful, once in a lifetime experience for both our youth and adults. Monday was our first full day at Convention. We started the day hearing from Walker Adams, former WEMO youth and intern, about General Convention as well as what he does at Sewanee. We also got to sit down with Gay Clark-Jennings, President of the House of Deputies, for a brief minute and ask her a few questions before heading over to sit in on our first legislative session. Each day, once we arrived at the convention center, the youth had the option of getting to go sit in The House of Deputies during their sessions or explore the Exhibit Hall and talk to many different exhibitors about their booths. When in open session, some of us would go to the House of Bishops and listen to their discussion as well! In between legislative sessions, joint sessions, and talking to exhibitors, the WEMO Youth got to meet with lots of people involved in various parts of the Episcopal church. Monday afternoon we got to meet with Bill Campbell, Executive Director of Forma, and talk with him about Forma’s presence at General Convention and what all they do as an organization. That evening we had the chance to tour Seminary of the Southwest with Joe Pierjok, student at Southwest from Church of the Redeemer in Kansas City. 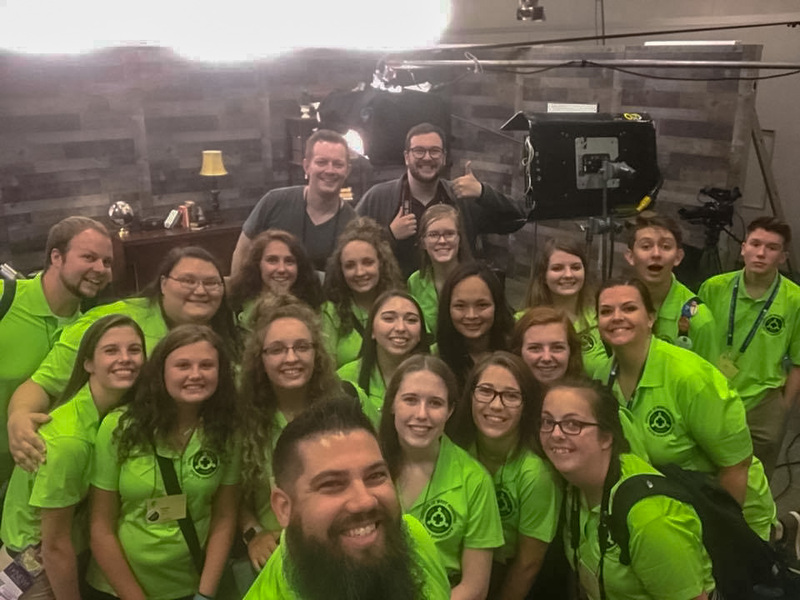 Some other highlights from the week include touring the media hub TV Studio built for General Convention inside the convention center, running into Presiding Bishop Michael Curry, hearing from Shannon Kelly, Officer for Young Adult & Campus Ministries, and some of us helping to serve communion at the convention’s closing Eucharist. We had lunch with our deputation and used the opportunity to ask them questions about their experience. We also attended a youth gathering one night to meet with other youth at General Convention. It was a week full of new experiences for some of the WEMO Youth and while we were busy we learned a lot. We learned how to love everyone regardless of our differences through the adoption of the Diocese of Cuba back into The Episcopal Church. The business of the church might not always be glamorous, but it is important nonetheless. Having been immersed in General Convention for a week, the youth of this diocese experienced the Episcopal Church in new, fascinating ways and enjoyed it all. Hayley Cobb is an intern with the diocesan youth ministry.